Amy I have an ongoing magpie related game. I’m not sure how well known this little rhyme is outside of the UK (or outside of our house really) but it goes like this. One for sorrow, Two for joy, Three for a girl, Four for a boy. Five for silver, Six for gold, Seven for a secret never to be told. Youi get how it goes. 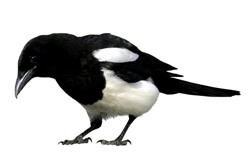 Count the magpies – expect your joy etc etc. Around the time we concieved Squishy, we saw nothing but pairs of magpies. Maybe something to do with the fact that it was May and probably magpie mating season, but still. So, the other day Amy saw fourteen magpies. What on earth does that “mean”? Tell me about any silly games you guys play to keep the trying to concieve blues at bay? This entry was posted in 2015, fertility, infertility, ladybirds, magpies, signs, silly, trying to conceive and tagged infertility, trying to conceive. Bookmark the permalink. We were going by the number/quality of yolks in any eggs we ate! If we got the infamous double-yolked egg, we thought we would have twins (or two children in our future). If the yolk didn’t look so nice, i.e., it had some blood in it or it was mishapen, it was a “no go.” I don’t know about this method, but it kept us thinking hopeful thoughts for the future when we got great looking egg yolks! It likely means you will have no song birds in your location. Magpies are not very nice, they hop along the hedgerow eating the eggs and young of other smaller birds. Two spoons in a teacup means there will be a new baby in the family.